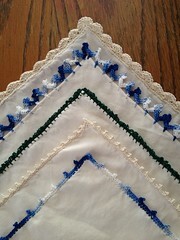 Feb 26, 2012 was posted on February 26th, 2012 at 11.07am and is filed under Blog, Handmade. This entry has no comments (yet). You can follow any responses through the RSS 2.0 Feed. Hello, yes, I’m still alive. Fell out of the habit of blogging, but I’ll try to get back in. Hmm, what has been going on…. On Dan’s recommendation I read Neal Stephenson’s “REAMDE” and loved it. Really fun plot, great characters, beautifully written. I would say “I couldn’t put it down” except I did force myself to put it down occasionally so that I could postpone reaching the end! I played a lot too much Skyward Sword in January and did something awful to my right arm. Had to take a break from knitting which pretty much drove me crazy. 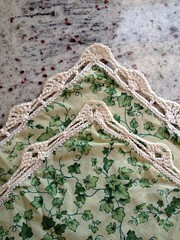 Eventually I found out that I could crochet without too much pain so I had a ton of fun making lovely lace-edged hankies to replace my nasty old cut-up-t-shirt ones. 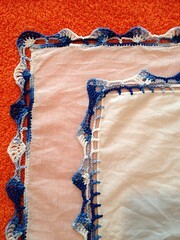 http://lacycrochet.blogspot.com/ (love those charts! ), and got a few more out of this great $2 pdf booklet: Edgings: 100 Old and New Favorites.